Modern Olympism emerged at the end of the nineteenth century as a philosophy of social reform that sought to use sport for the betterment of the world. It drew on a number of intellectual and material sources, including the ancient Greek heritage, philosophical ideas of Enlightenment, the English educational system, and the emerging spirit of industrial capitalism and internationalism. It is an eclectic and non-systematic body of knowledge, and has always been a controversial project. Indeed, in the words of its founder, Pierre de Coubertin (1863–1937), Olympism is an ‘unfinished symphony’. Interpretations of the fundamental tenets of Olympism concerning universalism, education, eligibility, independence from political and commercial interference, and fair play have been constantly negotiated and renegotiated through political, cultural, social, economic, and sporting struggles. These interpretations are reflected in various editions of the Olympic Charter and in a multitude of academic studies. 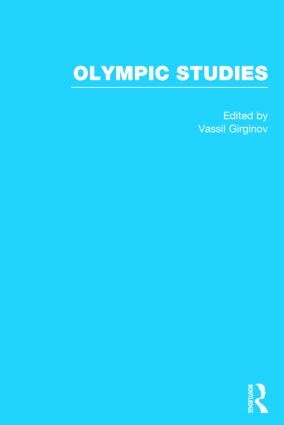 Edited and introduced by Vassil Girginov, this new four-volume collection from Routledge brings together key primary-source materials and the very best scholarship and commentary to elucidate and explore the evolution and interpretations of Olympism and its practical manifestation in the modern Olympic Games. The collection includes archive materials (some of which are reproduced in facsimile to give users a strong sense of immediacy to the original texts), personal accounts of major figures, as well as critical scholarship. Olympic Studies will also make readily accessible the best research produced under the auspices of Routledge’s ambitious 2012 Olympic Collection whereby over forty Olympic-focused journal special issues from a wide range of disciplines appeared during 2012 and 2013. Fully indexed and with a comprehensive introduction, newly written by the editor, which places the collected material in its historical and intellectual context, Olympic Studies is an essential work of reference. It is destined to be welcomed as a vital one-stop research tool. 1. N. Spivey, ‘Pythagoras and the Origins of Olympic Ideology’, in Barbara Goff and Michael Simpson (eds. ), Thinking the Olympics: The Classical Tradition and the Modern Games (Bristol Classical Press, 2011), pp. 21–39. 2. J. Swaddling, ‘The Site’, The Ancient Olympic Games (British Museum Publications Ltd, 2008), pp. 13–38. 3. H. M. Lee, ‘The First Olympic Games of 776 BC’, in W. J. Rashke (ed. ), The Archaeology of the Olympics: The Olympics and Other Festivals in Antiquity (University of Wisconsin Press, 1988), pp. 110–18. 4. I. Weiler, ‘The Predecessors of the Olympic Movement, and Pierre de Coubertin’, European Review, 2004, 12, 3, 427–43. 5. P. De. Coubertin, ‘Why I Revived the Olympic Games’, in W. L. Adams and L. R. Gerlach (eds. ), The Olympic Games: Ancient and Modern (Pearson Custom Publishing, 2002), pp. 109–12. 6. C. Georgiadis, ‘The Founding Congress of the International Olympic Committee (Paris 1894)’, Olympic Revival (Ekdotike Athenon, 2003), pp. 64–77. 7. N. Müller, ‘Coubertin’s Olympism’, in Müller (ed. ), Pierre de Coubertin 1863–1937, Olympism: Selected Writings (IOC, 2000), pp. 33–48. 8. D. A. Brown, ‘Pierre de Coubertin’s Olympic Exploration of Modernism, 1894–1914: Aesthetics, Ideology and the Spectacle’, Research Quarterly for Exercise and Sport, 1996, 67, 2, 121–35. 9. J. Seagrave, ‘Toward a Definition of Olympism’, in J. Segrave and D. Chu (eds. ), The Olympic Games in Transition (Human Kinetics, 1988), pp. 149–61. 10. S. Loland, ‘Coubertin’s Ideology of Olympism from the Perspective of the History of Ideas’, Olympika, 1995, IV, 49–77. 11. H. Reid, ‘East to Olympia: Recentering Olympic Philosophy Between East and West’, Olympika, 2010, 19, 59–80. 12. D. Yong, ‘From Olympia 776 to Athens 2004: The Origins and Authenticity of the Modern Olympic Games’, in K. Young and K. Wamsley (eds. ), Global Olympics (Elsevier, 2005), pp. 3–19. 13. M. Lämmer, ‘Myth or Reality: The Classical Olympic Athlete’, International Review for the Sociology of Sport, 1992, 27, 2, 107–14. 14. D. Booth, ‘Post-Olympism? Questioning Olympic Historiography’, in J. Bale and M. Christense (eds. ), Post-Olympism? Questioning Sport in the Twenty-first Century (Berg, 2004), pp. 13–32. 15. C. Shaw, ‘Higher, Faster, Stronger: The Myth of the Olympic Games and the Hidden History of the IOC’, Five Ring Circus: Myths and Realities of the Olympic Games (New Society, 2008), pp. 57–75. 16. D. Quanz, ‘Civil Pacifism and Sport-based Internationalism: Framework for the Founding of the International Olympic Committee’, Olympika, 1993, 2, 1–23. 17. D. MacIntosh and M. Hawes, ‘The IOC and the World of Interdependence’, Olympika, 1992, 1, 29–45. 18. C. Hill, ‘The Primacy of Politics in the Olympic Movement’, Olympic Politics (Manchester University Press, 1992), pp. 34–59. 19. A. Beacom, ‘Olympic Diplomacy: The IOC as Diplomatic Actor’, International Diplomacy and the Olympic Movement (Palgrave, 2012), pp. 40–62. 20. R. K. Barney, S. R. Wenn, and S. G. Martyn, ‘Protecting and Exploiting the Olympic Mystique: The Emergence of TOP’, Selling the Five Rings: The International Olympic Committee and the Rise of Olympic Commercialism (University of Utah Press, 2002), pp. 153–80. 21. A. Tomlinson, ‘The Commercialisation of the Olympics: Cities, Corporations, and the Olympic Commodity’, in K. Young and K. B. Wamsley (eds. ), Global Olympics: Historical and Sociological Studies of the Modern Games (Elsevier, 2005), pp. 179–200. 22. M. R. Real, ‘The Postmodern Olympics: Technology and the Commodification of the Olympic Movement’, Quest, 1996, 48, 1, 9–24. 23. J. J. MacAloon, ‘Olympic Games and the Theory of Spectacle in Modern Societies’, in J. MacAloon (ed. ), Rite, Drama, Festival, and Spectacle (Institute for the Study of Human Issues, 1984), pp. 241–80. 25. M. Moragas, N. K. Rivenburgh, and J. F. Larson, ‘Television and Olympic Community’, Television in the Olympics (John Libbey, 1995), pp. 123–41. 26. A. Billings, ‘Meet the "Framers": The Olympic Producers’, Olympic Media (Routledge, 2008), pp. 22–55. 27. J. Hargreaves, ‘Sporting Females’, Olympic Women: A Struggle for Recognition (Routledge, 1994), pp. 209–34. 28. R. McLaren, ‘A New Order: Athletes’ Rights and the Court of Arbitration at the Olympic Games’, Olympika, 1998, 7, 1–24. 29. D. Chathziefstathiou and I. Henry, ‘Technologies of Power, Governmentality and Discourses of Olympism in the Twenty-first Century’, Discourses of Olympism: From the Sorbonne 1894 to London 2012 (Palgrave, 2013), pp. 247–73. 30. O. Schantz and K. Gilbert, ‘The Paralympic Movement: Empowerment or Disempowerment for People with Disabilities?’, in H. Lenskyj and S. Wagg, The Palgrave Handbook of Olympic Studies (2013), pp. 358–81. 31. L. DaCosta, ‘A Never-ending Story: The Philosophical Controversy Over Olympism’, Journal of the Philosophy of Sport, 2006, 33, 157–73. 32. C. Torres, ‘Results or Participation? Reconsidering Olympism’s Approach to Competition’, Quest, 2006, 58, 2, 242–54. 33. G. McFee, ‘The Promise of Olympism’, in J. Sugden and A. Tomlinson (eds. ), Watching the Olympics (Routledge, 2012), pp. 36–55. 34. A. Ferrand, J.-L. Chappelet, and B. Seguin, ‘Olympic Marketing’, Olympic Brand Marketing System (Routledge, 2012), pp. 54–78. 35. M. Parent, ‘Olympic Games Stakeholders: Governance and Management’, in S. Frawley and D. Adair (eds. ), Managing the Olympics (Palgrave, 2013), pp. 15–32. 36. D. Mason, L. Thibault, and L. Mesner, ‘An Agency Theory Perspective on Corruption in Sport: The Case of the International Olympic Committee’, Journal of Sport Management, 2006, 20, 1, 52–73. 37. J. Hoberman, The Olympic Crisis: Sport, Politics and the Moral Order (Aristide D. Caratzas, 1986), pp. 81–126. 38. M. McNamee, ‘Olympism, Eurocentricity, and Transcultural Virtues’, Journal of the Philosophy of Sport, 2006, 33, 2, 174–87. 39. H. Hiller, ‘Building an Interpretative Model’, Host Cities and the Olympics: An Interactionist Approach (Routledge, 2012), pp. 9–31. 40. M. Silk, ‘Towards a Sociological Analysis of London 2012’, Sociology, 2011, 45, 5, 733–48. 41. D. Binder, ‘Olympic Values Education: Evolution of a Pedagogy’, Educational Review, 2012, 64, 3, 275–303. 42. S. Teetzel, ‘Optimizing Olympic Education: A Comprehensive Approach to Understanding and Teaching the Philosophy of Olympism’, Educational Review, 2012, 64, 3, 317–33. 43. R. Naul, ‘Olympic Games and Olympic Education: Olympic Education and Olympic Pedagogy’, Olympic Education (Mayer and Mayer, 2008), pp. 102–31. 44. J. Gold and M. Gold, ‘From A to B: The Summer Olympics, 1896–2008’, in Gold and Gold (eds. ), Olympic Cities (Routledge, 2011), pp. 17–56. 45. G. Poynter, ‘The Evolution of the Olympic and Paralympic Games, 1948–2012’, in Poynter and MacRusry (eds. ), Olympic Cities: 2012 and the Remaking of London (Ashgate, 2009), pp. 23–13. 46. A. Pitts and H. Liao, ‘Urban Development’, Sustainable Olympic Design and Urban Development (Routledge, 2009), pp. 29–48. 47. G. Andranovich, M. Burbank, and C. Heying, ‘Olympic Cities: Lessons Learned from Mega-Event Politics’, Journal of Urban Affairs, 2001, 23, 2, 113–31. 48. B. Surborg, R. VanWynsberghe, and E. Wyly, ‘Mapping the Olympic Growth Machine: Transnational Urbanism and the Growth Machine Diaspora’, City, 2008, 12, 3, 341– 55. 49. B. Garcia, ‘The Olympic Games Cultural Programme’, The Olympic Games Cultural Policy (Routledge, 2012), pp. 28–50. 51. R. Spaaij, ‘Olympic Rings of Peace? The Olympic Movement, Peacemaking and Intercultural Understanding’, Sport in Society, 2012, 15, 6, 761–74. 52. S. Darnell, ‘Olympism in Action: Olympic Hosting and the Politics of "Sport for Development and Peace": Investigating the Development Discourses of Rio 2016’, Sport in Society: Cultures, Commerce, Media, Politics, 2012, 15, 6, 869–87. 53. H. Preus, ‘Financing of the Games: Interests, Winners and Losers’, The Economics of Staging the Olympics: A Comparison of the Games 1972–2008 (Edward Elgar, 2004), pp. 12–34. 54. F. Brunett, ‘The Economy of the Barcelona Olympic Games’, in G. Poynet and I. MacRury (eds. ), Olympic Cities: 2012 and the Remaking of the City (Ashgate, 2009), pp. 97–119. 55. D. O’Brien, ‘Event Business Leveraging: The Sydney 2000 Olympic Games’, Annals of Tourism Research, 2006, 33, 1, 240–61. 56. M. Weed, ‘Who are Olympic Tourists?’, Olympic Tourism, 2008, 23–45. 57. R. Cashman, ‘The Benchmark Games’, Benchmark Games: The Sydney 2000 Paralympic Games (Walla Press, 2008), pp. 56–99. 58. S. Essex and B. Chalkley, ‘Olympic Games: Catalyst of Urban Change’, Leisure Studies, 1998, 17, 3, 187– 206. 59. M.-A. Glynn, ‘Configuring the Field of Play: How Hosting the Olympic Games Impacts Civic Community’, Journal of Management Studies, 2008, 45, 6, 1117–46. 60. V. Girginov and L. Hills, ‘The Political Process of Constructing Sustainable London Olympics Sports Development Legacy’, International Journal of Sport Policy and Politics, 2009, 1, 2, 161–81. 61. A. Richards, P. Fussey, and A. Silke, ‘Towards an Understanding of Terrorism and the Olympics’, in Richards, Fussey, and Silke (eds. ), Terrorism　and the　Olympics: Major Event Security and Lessons for the Future (Routledge, 2011), pp. 1–13. 62. W. Jennings, ‘Risk and the Games’, Olympic Risks (Palgrave, 2012), pp. 41–64. 63. P. Boyle and K. Haggerty, ‘Spectacular Security: Mega-Events and the Security Complex’, International Political Sociology, 2009, 3, 257–74. 64. I. Ritchie, ‘The Use of Performance-enhancing Substances in the Olympic Games: A Critical History’, in H. Lenskyj, and S. Wagg (eds. ), The Palgrave Handbook of Olympic Studies (Palgrave, 2012), pp. 410–29. 65. T. Hunt, ‘Defining the Problem’, Drug Games: The IOC and the Politics of Doping, 1960–2008 (University of Texas Press, 2011), pp. 6–27. 66. J. Hoberman, ‘Olympic Drug Testing: An Interpretive History’, in K. Young and K. B. Wamsley (eds. ), Global Olympics: Historical and Sociological Studies of the Modern Games (Elsevier, 2005), pp. 249–68. 67. B. Hutchins and D. Rowe, ‘Blogging, Social Networking Sites and Information Accidents’, Sport Beyond Television: The Internet, Digital Media and the Rise of Networked Media Sport (Routledge, 2012), pp. 72–100. 68. D. Marshall, B. Walker, and N. Russo, ‘Mediating the Olympics’, Convergence, 2010, 16, 3, 263–78. 69. A. Miah, ‘Tweeting the Olympics’, in V. Girginov (ed. ), Handbook of the London 2012 Olympic and Paralympic Games, Vol. 2 (2013), pp. 96–109. 70. E. Peña, ‘New Media and the Olympic Games: The Olympic Movement and the Social Web in the Dissemination of Messages’, in E. Pena et al. (eds. ), An Olympic Mosaic: Multidisciplinary Research and Dissemination of Olympic Studies (CEO, 2011), pp. 143–52. 71. D. Wong, ‘Expect the Unexpected? An Evaluation of the Singapore 2010 Youth Olympic Games’, Journal of Policy Research in Tourism, Leisure & Events, 2012, 4, 2, 138–54. 72. S. Halbwirth and K. Toohey, ‘Information, Knowledge and the Organization of the Olympic Games’, in S. Frawley and D. Adair (eds. ), Managing the Olympics (Palgrave, 2013), pp. 33–49. 73. J. Timms, ‘The Olympics as a Platform for Protest: A Case Study of the London 2012 "Ethical" Games and the Play Fair Campaign for Workers’ Rights’, Leisure Studies, 2012, 31, 3, 355–72. 74. H. Lenskyj, ‘The Olympic Industry and Civil Liberties: The Threat to Free Speech and Freedom of Assembly’, Sport in Society: Cultures, Commerce, Media, Politics, 2004, 7, 3, 370–84. 75. M. Roche, ‘Perspectives and Themes’, Mega-events and Modernity: Olympics and Expos in the Growth of Global Culture (Routledge, 2000), pp. 1–29. 76. D. Getz, ‘Science, Knowledge and Theory for Event Studies’, Event Studies, 2nd edn. (Routledge, 2012), pp. 355–78. 77. J. Horne and W. Manzenreiter, ‘An Introduction to the Sociology of Sports Mega-events’, Sociological Review, 2006, 54, 1–24.